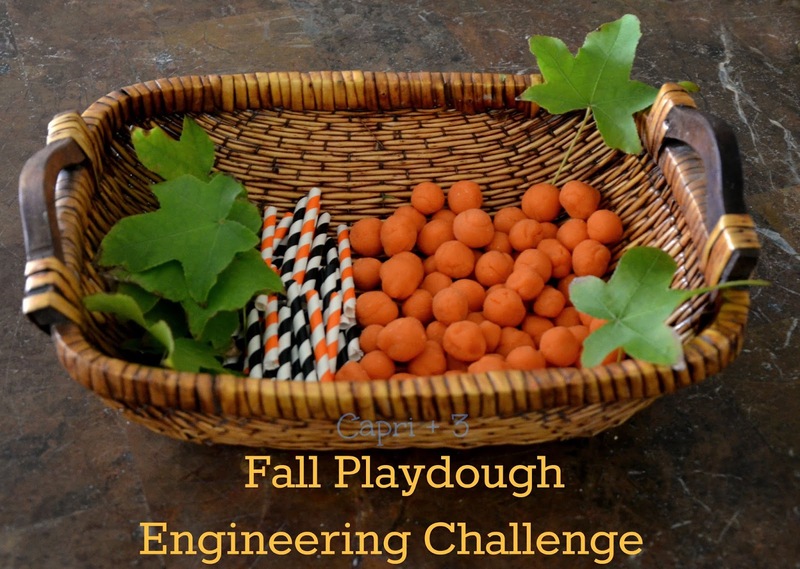 This week, we did a Fall Playdough Engineering challenge. The kids used the basket contents to make their own structures. It is more challenging than it looks to keep the structures upright and it was fun to see their minds at work while they tried to figure out how to make their buildings taller and more robust. You can either roll the playdough into balls yourself or have the children do it. We did about half and half. Rolling the playdough is great find motor practice. Then, present the materials and encourage them to build. I originally intended to give them a ruler to measure their structures, but the process of building with these materials was challenging enough and they came up with structures both tall and short which were interesting. They used the leaves to make flowers, trees and roofs for their buildings. They made shapes on the table, which could be an engineering feet in of itself. Then they expanded their triangles to form pyramids. If you are doing this in a classroom setting, this activity can be presented as one basket per group. They can work together to make the balls before they begin (or they can be premade for them). What a great little engineer you have! I love this building challenge! The addition of the leaves make for wonderful constructions! I really like to provide open ended building challenges for the kids when the come home afterschool. It is a great opportunity for them to de-stress while using their creativity and problem solving. Ohhh brilliant fun and like Amanda this would be great for after school for the kids. 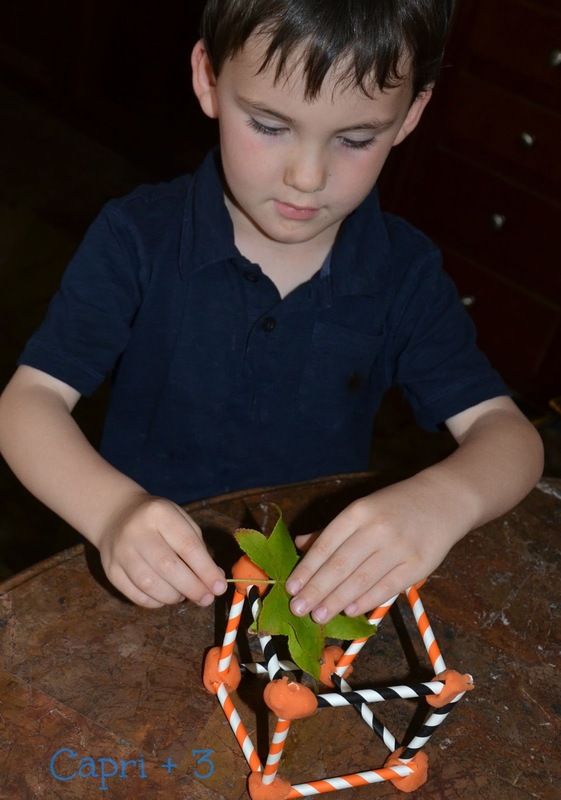 They would both love it and fantastic for OT fine motor skills for my eldest. The leaves did change the construction. It was fun to see them add them in. It is fun for after school. They can challenge their minds while having fun. 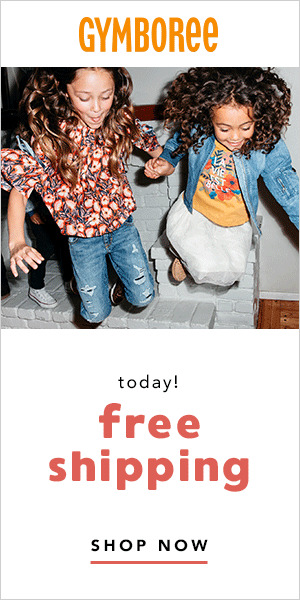 I hope your kids enjoy trying this some time after school. 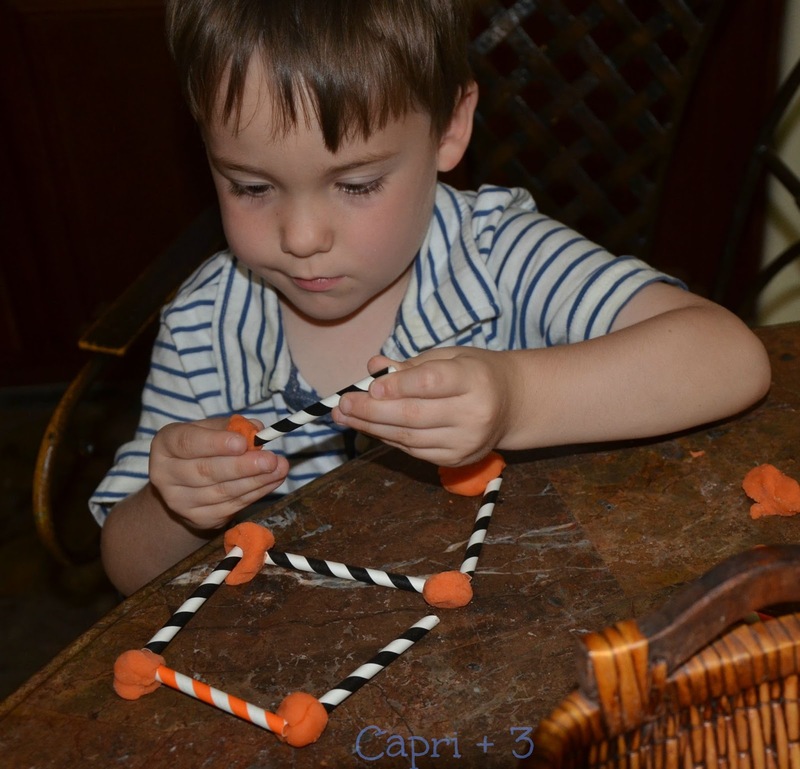 I think your eldest would have fun practicing fine motor without even realizing it. It was fun to see how long each of ours stayed with their projects and changed their strategies with trial and error. I love this! And cinnamon, yum, I bet it smells great! This is a great idea! 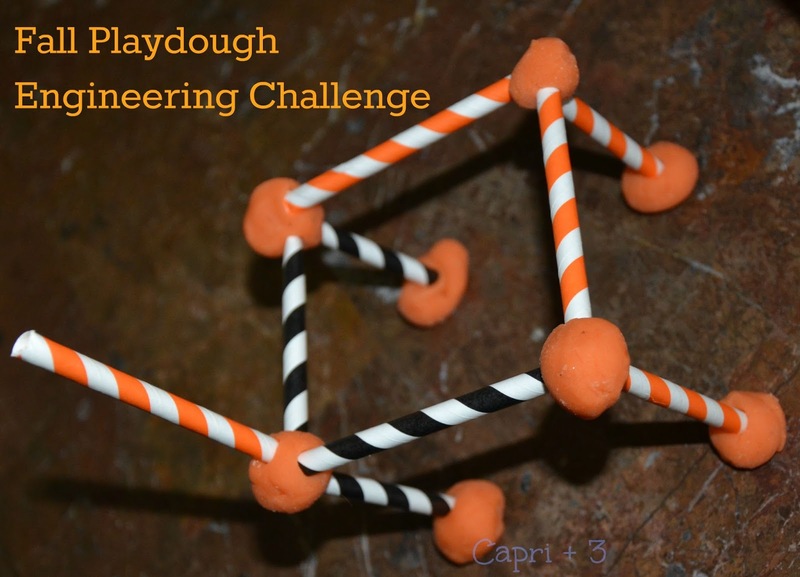 Do you find the homemade playdough works as well as store bought? Cinnamon really adds to the experience. I found myself joining the challenge myself, drawn in by the scent! I think it works just as well and when you add a scent, it really enhances the experience. I highly recommend it. It doesn't take long, lasts a long time and is really worth the effort. It is really fun for the kids to play with when it is still warm (but cool enough to handle). Ooooooh!!! My three year old would love this! My six year old would, too, but my three year old really, truly loves things like this! GREAT idea!! I hope your 3 year-old enjoys it. I have to admit that even I enjoyed it. I want my husband to try it too when he gets home from work since he is an engineer. I'd like to see what he can build. The kids would love to see him trying it ou. We love engineering activities! We have all the supplies we need for this one, thanks for the idea! It looks like they had a great time! I hope your family enjoys it. Yes, they did. It kept them engaged for quite a while. Then, I put the play dough in a Ziploc bag so we can do it again. Love it! I have those very straws, and cinnamon essential oil – we can do this soon! Thanks so much for the awesome idea. My prek kiddos will have such fun with it. Love it! I have the same straws from last year. We will be doing this one weekend. Such an easy and fun idea! We just made play dough the other day. My kids are going to love this. I hope your pre-k kids have a blast with this. I hope your kids enjoy it. Mine were saved from last year too. They are such fun looking straws.